Marrakech Grand Prix silver medallist Loriana KUKA (KOS) gave her country their second gold medal from their two-strong team in Tbilisi. KUKA, who only made her Grand Prix debut a year ago, followed in the footsteps of her teammate Nora GJAKOVA (KOS) who won -57kg gold on day one. The world number 16 scored twice against former world bronze medallist Kaliema ANTOMARCHI (CUB) who will have to fight again in order to win her first IJF title. 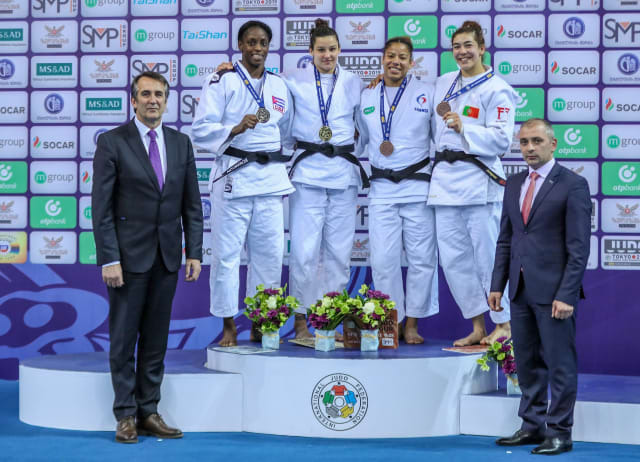 In the first semi-final ANTOMARCHI dismissed The Hague Grand Prix silver medallist Sama Hawa CAMARA (FRA) by ippon while in the second semi-final KUKA reigned against former World Judo Masters bronze medallist Fanny Estelle POSVITE (FRA) by a waza-ari score. 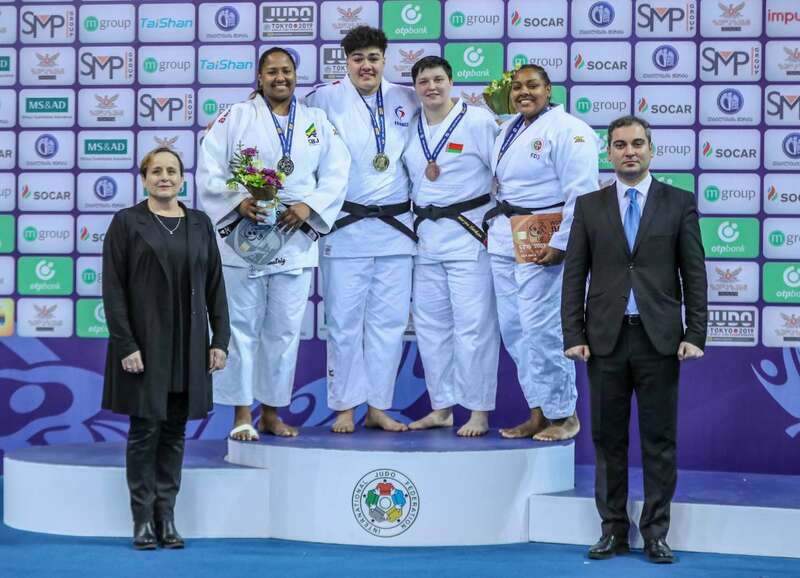 The first bronze medal contest was won by POSVITE who marked her first IJF outing at her new weight of -78kg by beating 2018 Tbilisi Grand Prix silver medallist Anastasiya TURCHYN (UKR) who was disqualified after receiving three penalties. The second bronze medal was won by Marrakech Grand Prix bronze medallist Patricia SAMPAIO (POR) as the teenager continued to impress with two scores going unanswered against CAMARA. 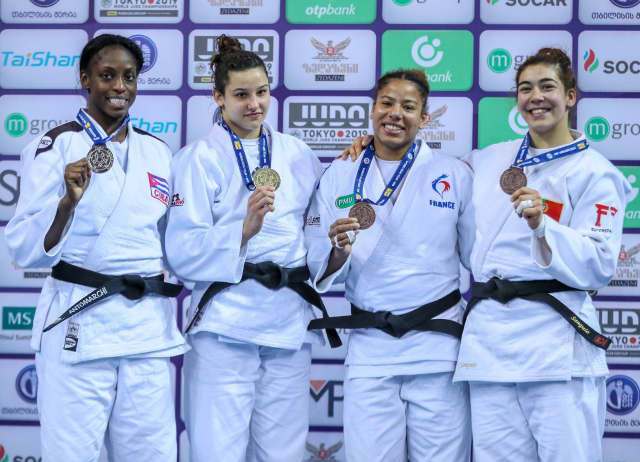 French outsider Julia TOLOFUA (FRA) was the surprise heavyweight winner on the last day in Tbilisi as the little-known +78kg fighter defeated Junior World Championships silver medallist Beatriz SOUZA (BRA) in the final. In her first IJF final TOLOFUA took the contest to the world number nine who was thrown with an o-soto-gari for a waza-ari score and that was the only time the scoreboard was summoned. The race to be France’s number one female heavyweight has now been blown wide open with Anne Fatoumata M BAIRO (FRA) only managing fifth-place today while heavyweight starlet and 2018 Tbilisi Grand Prix winner Romane DICKO (FR) still to compete since her win a year ago due to a lengthy run of injuries. In the first semi-final Ekaterinburg Grand Slam bronze medallist Rochele NUNES (POR) lost out to TOLOFUA by a waza-ari score. In the second semi-final SOUZA defeated Ekaterinburg Grand Slam silver medallist Anne Fatoumata M BAIRO (FRA) who was trapped in osaekomi for 10 seconds after being thrown for a waza-ari score. 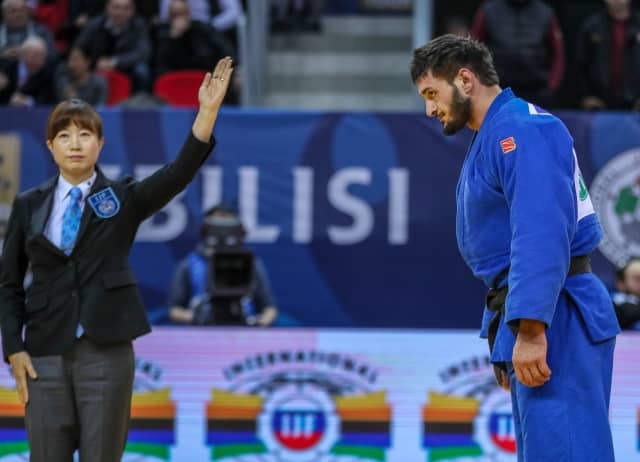 The first bronze medal was awarded to The Hague Grand Prix winner Maryna SLUTSKAYA (BLR) who tapped put M BAIRO on the ground to claim her tenth Grand Prix medal. The second bronze medal was won by NUNES who dismissed world number 17 Galyna TARASOVA (UKR) with an efficient makikomi and a lunging o-uchi-gari which won over the crowd who celebrated with the former Brazil international. 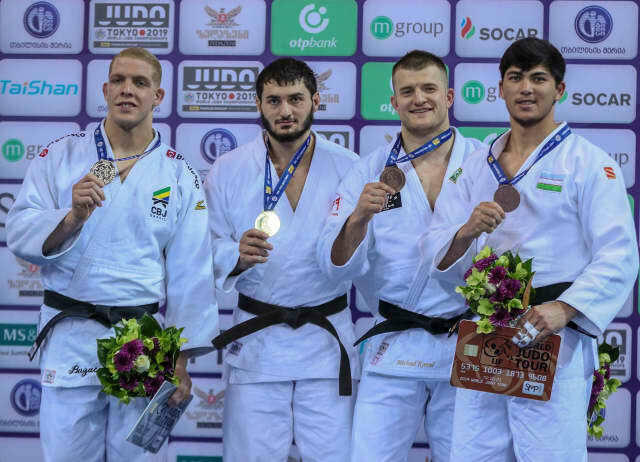 World silver medallist Ivan Felipe SILVA MORALES (CUB) clinched his third Grand Prix gold medal as he bested 2018 Tbilisi Grand Prix silver medallist Giorgi PAPUNASHVILI (GEO) in the -90kg final. The unfortunate PAPUNASHVILI finished second for the second year in a row as he noticeably tired in golden score while SILVA MORALES still looked fresh and pushed the pace. The Cuban star wrapped his left leg around his Georgian adversary on the edge of the area for a waza-ari score to win gold. 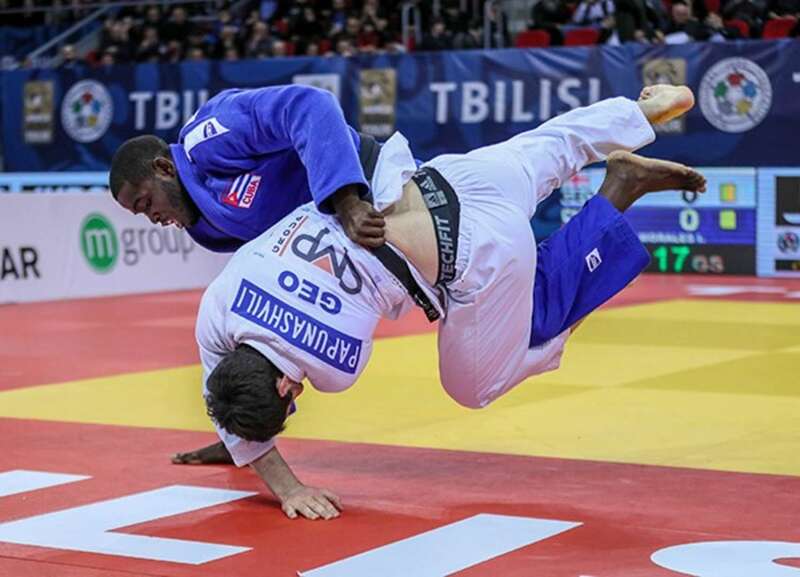 In the first semi-final PAPUNASHVILI beat Ekaterinburg Grand Slam silver medallist Beka GVINIASHVILI (GEO) after the former -100kg judoka bridged and therefore ippon was awarded. 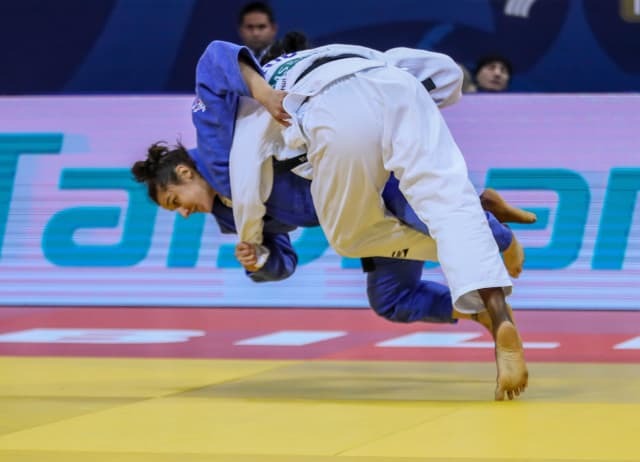 In the second semi-final SILVA MORALES defeated world number 110 and former Tashkent Grand Prix winner Davlat BOBONOV (UZB) by ippon. 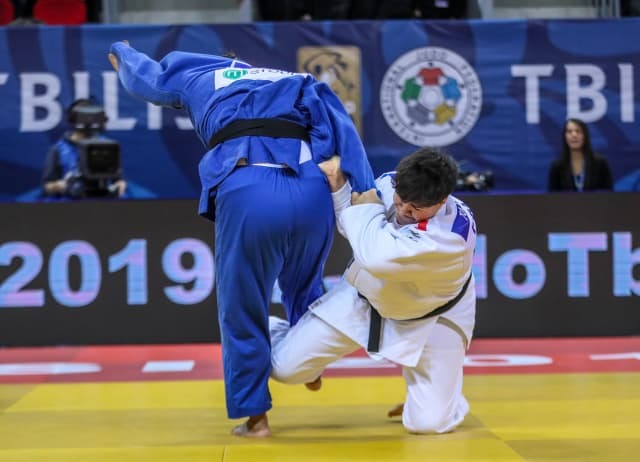 The first bronze medal was won by Asian Games silver medallist GANTULGA Altanbagana (MGL) who squeezed past BOBONOV by a waza-ari score from a uchi-mata-sukashi in the opening contest of the final block. The second bronze medal went to GVINIASHVILI who defeated 2017 world champion Nemanja MAJDOV (SRB) after 62 seconds of golden score. Battling Serbian MAJDOV went into golden score in all five of his contests and won four of them before meeting his match in Georgia’s home star. GVINIASHVILI threw with a sasae-tsurikomi-ashi for a waza-ari score and his immensely disappointed opponent was quick to pay tribute to his rival as both men shared a shared a smile and the former raised the hand up of his opponent to a standing ovation from the Georgian faithful. Hohhot Grand Prix silver medallist Kazbek ZANKISHIEV (RUS) won his country’s first and only gold medal in Tbilisi as he prevailed against a shot-shy Cancun Grand Prix bronze medallist Rafael BUZACARINI (BRA). The Brazilian had never won an IJF gold medal and you could see why on this showing as he picked up three shidos to gift the gold medal to the Russian who now has a hat-trick of Grand Prix titles. In the first semi-final world number 65 Giuliano LOPORCHIO (ITA) fell to BUZACARINI after picking up three penalties. In the second semi-final The Hague Grand Prix bronze medallist Michael KORREL (NED) was penalised for the third and final time for passivity in golden score to send ZANKISHIEV into the final. 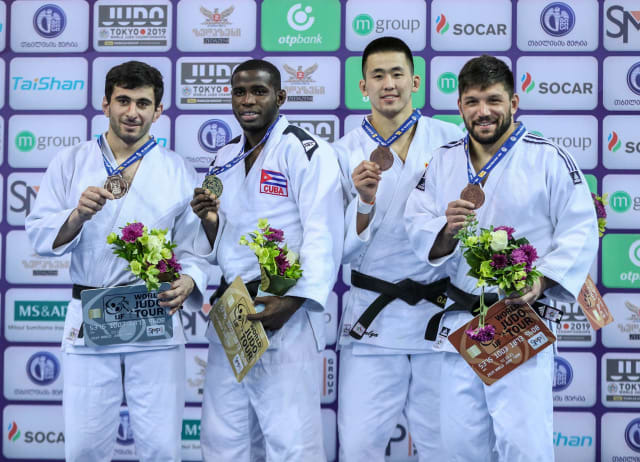 The first bronze medal was won by KORREL who dominated world number 83 Cedric OLIVAR (FRA) with a ippon seoi-nage and sode-tsurikomi-goshi seeing him past the Frenchman for his seventh Grand Prix medal. 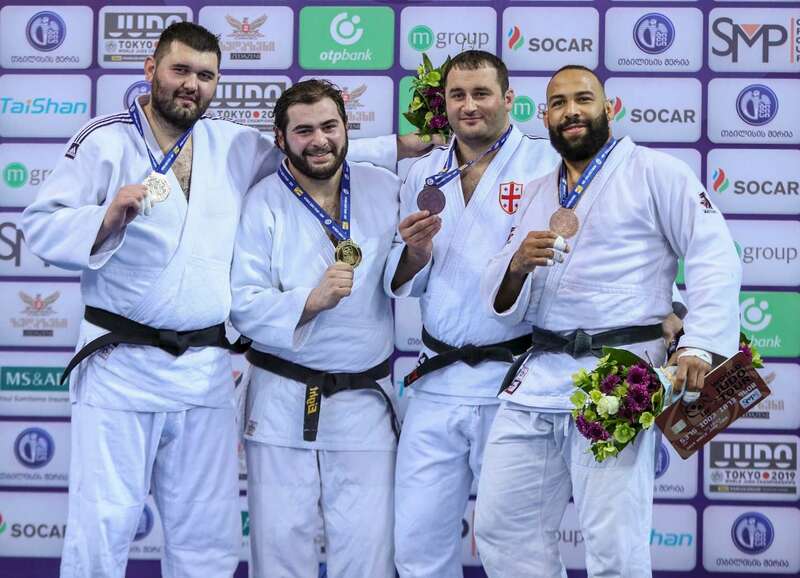 The second bronze medal went to Marrakech Grand Prix bronze medallist Mukhammadkarim KHURRAMOV who saw off LOPORCHIO with two waza-ari scores in the penultimate contest of the -100kg category. 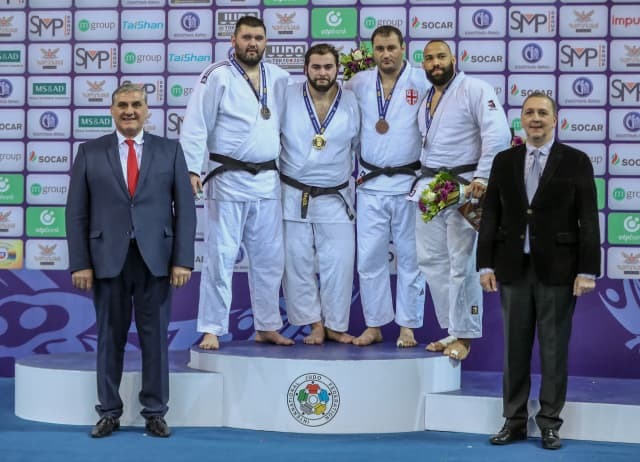 World number 44 Levani MATIASHVILI (GEO) won his home Grand Prix for the second time in his career to end the Tbilisi tournament with heavyweight gold for the hosts. 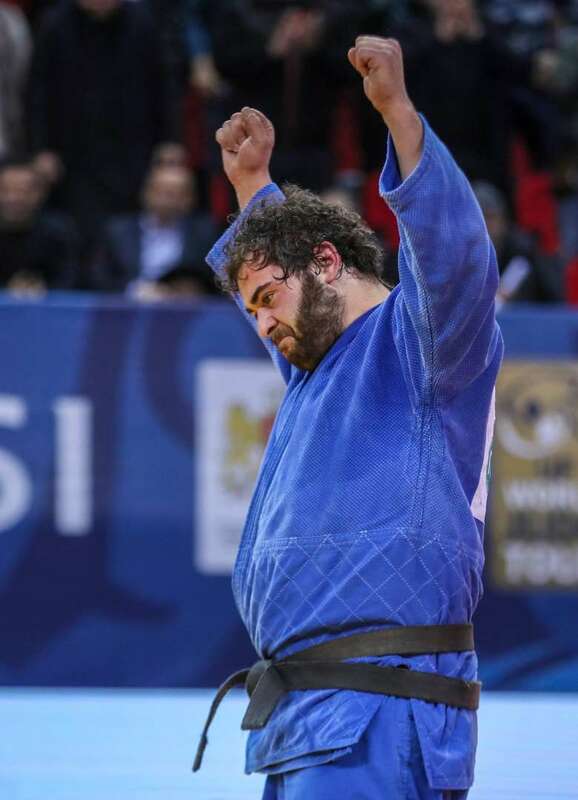 MATIASHVILI repeated his 2015 Tbilisi win by dispatching Tel Aviv Grand Prix bronze medallist Aliaksandr VAKHAVIAK (BLR) with a makikomi after four minutes of golden score to send the home crowd wild. In the first semi-final number one seed ROY MEYER (NED) had to submit to a juji-gatame from VAKHAVIAK (BLR). 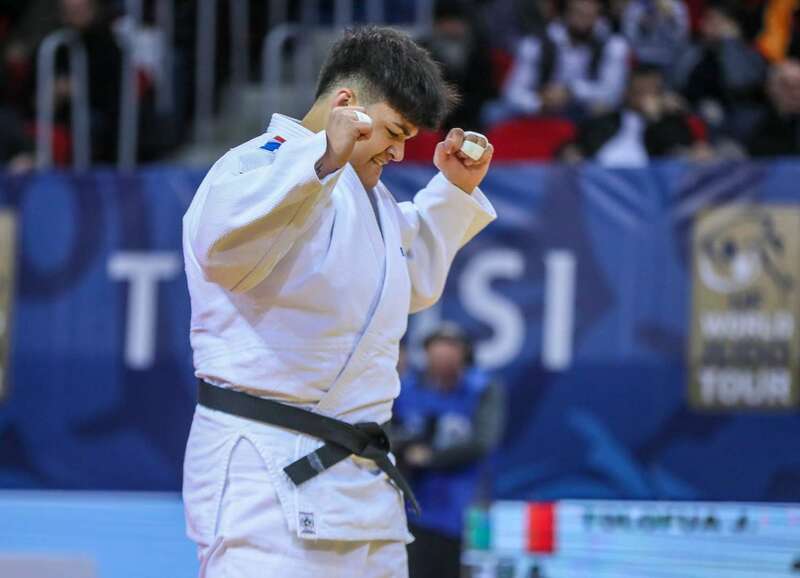 In the second semi-final Junior World Championships winner Gela ZAALISHVILI (GEO) was catapulted towards the tatami by MATIASHVILI (GEO) with an o-soto-gari for ippon after two minutes of golden score. 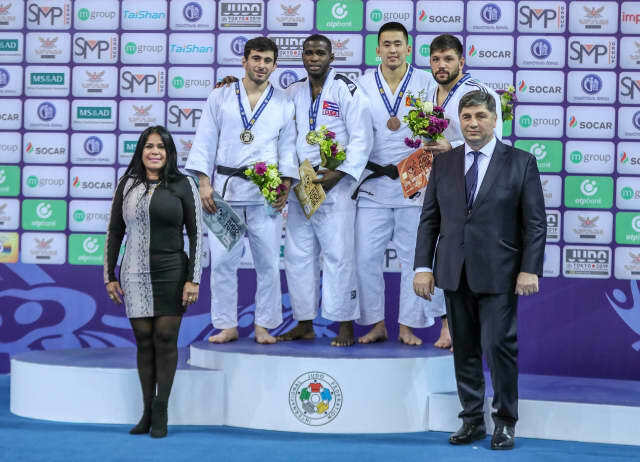 The first bronze medal was won by former Baku Grand Slam bronze medallist Onise BUGHADZE (GEO) who threw teammate ZAALISHVILI for a waza-ari and held down the youngster with a kami-shiho-gatame for 10 seconds. 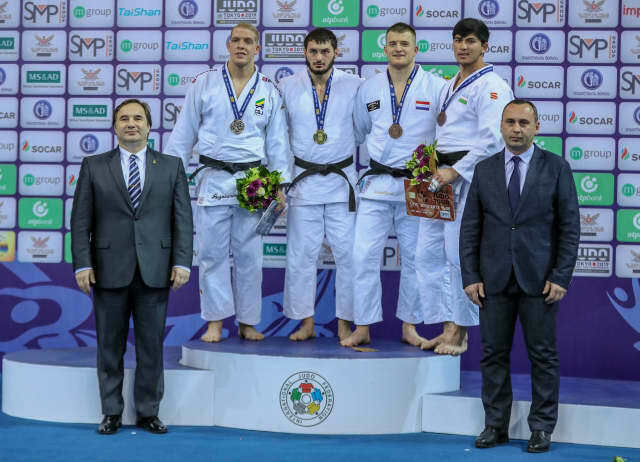 The second bronze medal went to MEYER who used all of his experience to move world number 162 and IJF World Judo Tour newcomer Alen TSKHOVREBOV (RUS) around the tatami at will as the Grand Prix debutant received three penalties and was disqualified.